White sandy beaches, huge waves, surfing, volcanoes and my Hawiaan favorite Mai Tai’s – Oh, wait that’s the Honolulu, Hawaii – this “Honolulu” is a codename for one of the latest projects that Microsoft’s Windows Server Management team has been developing and is now available in Technical Preview. There’s been a lot of push in the industry to get away from servers with a UI – less footprint, fewer security patches, fewer reboots – these are all good reasons to deploy servers with a minimized footprint. Now, regardless of this hype and push Microsoft has towards user interface’less server environments, PowerShell and remote management – we all still want a UI to click through. Azure Server Management Tools (SMT) was introduced to help solve this request, but it required Azure. Customers want something to run within their datacenter that connects to their on-premises servers and gives good performance statistics while providing the ability to remotely manage the components and virtual machines running. Enter Project Honolulu – this locally installed, new web-based Server Management tool is able to be installed on Windows 10 or Windows Server 2016 (NOT Server 2012 or 2012R2). Here’s the official deployment guide from Microsoft. The screenshot below is from my lab. The server is a domain controller, its worth noting that Honolulu does not replicate any of the Remote Server Administration Tools (RSAT) like A/D Users & Computers (DSA.msc), DNS or DHCP for instance. Servers are added to Honolulu via the Add Server button in the server manager section. Servers are able to be added via FQDN or via .txt file. I hope in the future that the tool will be able to browse Active Directory and allow Administrators to add servers based the hierarchy – OU’s or Security Groups for instance. The Overview section shows detailed information about the specific servers being managed like hostname, memory, total disk space and free disk space. Below there are in-guest performance charts for CPU, Memory, Network, and Disk which are viewed in realtime. These are just like what you’d see locally on a server through Perfmon. One feature I really like is the ability to remotely control every aspect of the servers including the individual devices on the VMs or physical boxes. 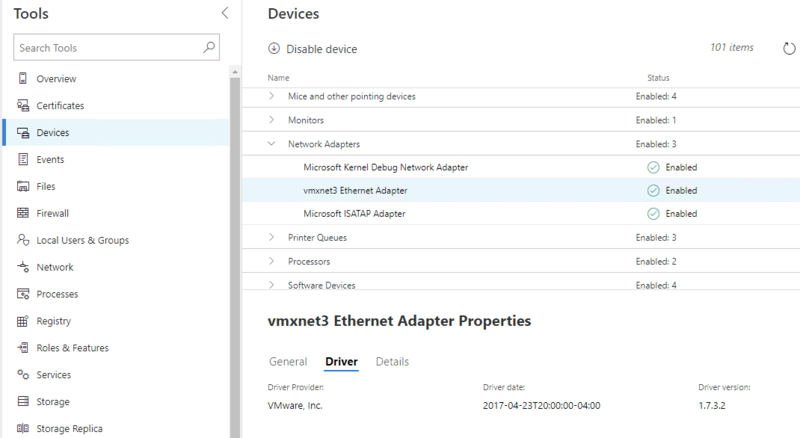 This is good for remote management of Windows Server Core where there’s no UI and traditional Computer Management – Device Manager is spotty at best. The image above shows the Network Adapters on my VMware virtual machine and you can even disable / enable devices. Pretty cool. 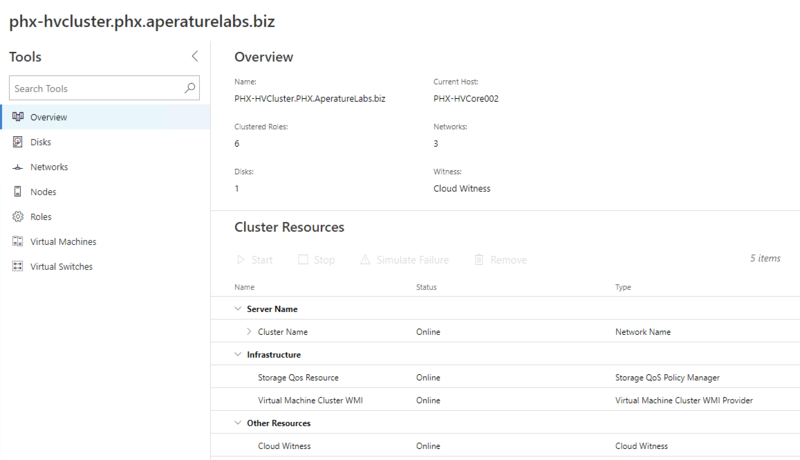 You can also use Honolulu to connect to Windows Failover Clusters and the new Windows Server 2016 Hyper-Converged solution, Storage Spaces Direct. The level of detail that is collected about Failover Clusters is quite detailed. The image below shows us the main overview page of my 2-node Hyper-V Cluster. On the left you can drill into your disks – .CSV in this case – Networks, Nodes, Roles and Virutal Machines. You can also completely manage all of the VMs running on your Failover Cluster nodes too! All in all I’d say that the Server Management team is definitely on the right track with Project Honolulu. I’m going to keep working with the tool and will definitely post more when I get to dig in further.